Conflict strikes all of us with about 22 stressors on a normal day. So why do some take stressors in stride well yet others snap back? 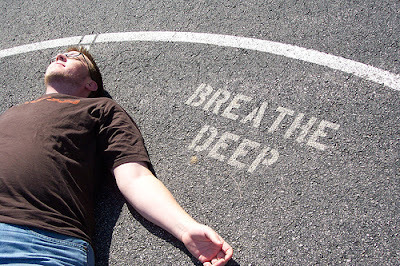 Recent research puts new emphasis on breathing deep when stressors hit. A deep breath helps you to tame the amygdala triggers for emotional outbursts. Take a few more deep breaths today and you can expect calm under pressure, according to neuro-scientist Joshua Gordon at Columbia. Woops! retake: Is there a certain breathing rate equivolent to a certain brainwave ? Is there certain breathing equivolent to certain brainwaves ? Thanks Genni for stopping by and for your kind words. Spent part of this morning out weeding along a creek in my yard and it’s fun to breath is fresh air too:-). You? Hey Chris, what’s up? Thanks for stopping by! In your work perhaps the deeper breathing becomes a bit more of a pattern since you are moving around more. Have you found that to be so, and have you noticed that breathing impacts your ability to come up with insights you need in decision making? Thanks for the reminder Ellen. Breathing, being basic to life, it seems that we would try no to skimp. I will be breathing better this weekend after reading your post. Hope we are all surprised by joy before the day ends – because we breathed:-)! Good advice – and timley – I’m breathing!! !